I’m happy to present my recently published book, “Symbols of the Spirit: A Meditative Journey Through Art” . On the back cover: Glen takes us on a journey to explore eight iconic symbols that appear universally in early civilizations. She introduces archetypes—the bird, the circle, the lotus, the moon, the seed, the spiral, the vessel, and the vesica piscis—delving into both their meanings and their metaphors. She believes all are connected to the spiritual realm and have an undeniable link to the Sacred Feminine. Glen engages us with her unique style of art to illustrate each chapter and shares her personal stories and inspiration. Through research, intuition and a deep sense of creativity and interconnectedness, the author explains with words and visual images how these symbols with their hidden messages can enrich our daily lives and anchor us firmly on our spiritual path. Carl G. Jung in his book, Man and His Symbols, referred to certain symbols as archetypal—images that all of us can tap into through our unconscious mind, dream states and the creative process. For the last 25 years, Glen’s artwork in abstract symbolism has attempted to capture the essence of such imagery. 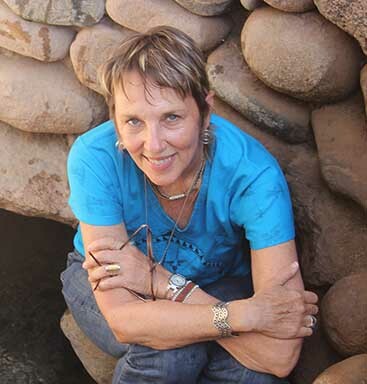 While in her previous book, Art & Sacred Sites: Connecting with Spirit of Place, she described her pilgrimages to sacred sites around the world as inspiration for her art, in Symbols of the Spirit, she focuses on the symbol. In these pages, Glen explains her intimate, personal encounters with the energies of these symbols, and how they’ve been a bridge to a more spiritual and connected life for her. She then goes one step further to share with the reader a meditation on each of the eight symbols, so they, too, can connect with these energies. It’s a powerful formula, backed by Glen’s years of exploration and experience, and a unique opportunity to enter a perhaps previously unthought-of spiritual territory. While one could – as I did, for so long – look at her prints and paintings merely as beautiful works of art, there’s a deeper level of connection and meaning to be found. To paraphrase Glen’s words, I urge you to experience this book “from the heart, not the head,” and allow the images and meditations to become a part of your visual and spiritual vocabulary too. Designed by Margery Cantor in collaboration with the artist. 104 pages, 9″ x 9″, soft cover, full color images, printed in Mexico City, $25usd. Add this book to your own collection or give to that special friend as a gift! Looking up at the sky, one can see two great circles, the sun and the moon. Here I find inspiration to create art using the most universal of shapes. The Circle is an archetypal symbol of wholeness and unity. Its roundness implies the feminine as the straight line does the masculine. This geometric shape, formed by a curving, never-ending line, creates a closed space which speaks of protection and inclusiveness. It is the simplest form, yet the strongest because it has no corners, no weak points. Circles pull me towards them with their promise of protection, like the warm embrace of a mother. In the studio I am open to an intuitive approach to creating art – going with the flow and being open to the possibilities. Often, a circle appears as I apply the ink to a plate and begin a new monotype print. Inspired by the circles of old, I use them as a point of departure to weave my own tale. (Here I’ve used a xerox transfer process to integrate the old stone circles from El Mesquita, in Cordoba, Spain). I went to Lima, Peru in October, where I had a solo exhibition thru November 27 as part of the Bienal Internacional de Grabado (International Biennal of Printmaking) sponsored by ICPNA ( Instituto Cultural Peruano Norteamericano). There were over 40 exhibitions as part of the Biennal over a 2 month period and represented artists from Belgium, Brazil, Chile, Spain, the U.S., Finland, France, Italy, Mexico and Peru. In this exhibition at Galeria ICPNA San Miguel, I had the opportunity to exhibit early large-scale prints along with recent works. I created most of these prints at KALA Institute in Berkeley, California in the early 1990’s, they represent the beginning of my exploration into symbolism as my primary artistic expression. My work continues along this line, and it was gratifying to see how seamlessly the work flowed. All of the monotype prints draw from a universal visual language of primal forms created by early cultures and inspired by nature. The circle speaks of unity, oneness, wholeness, the sun and the moon; the spiral reflects renewal, regeneration, evolution and growth; the oval or ‘vesical piscis’ is a symbol from sacred geometry that implies the womb, the seed, birth, and the beginning of life. My intent over the last 20 years has been to create work that reflects the essence of these forms that can touch us on an intuitive level. I visit sacred sites shrouded in mystery and imbued with the spirit of the ancients for inspiration. With each pilgrimage, I am drawn to the artifacts left behind by these early societies – sculptural details carved in stone, glyphs painted on cave walls, and designs found on pottery shards. In each location, repetition is found in the form of archetypal symbols such as the circle and the spiral – universal symbols that according to Carl Jung evoke a deep and unconscious response. Early on, I was drawn to Paleolithic and Neolithic sites where images of Mother Earth, the Divine Feminine, were revered. (Among them: Newgrange in Ireland, The Temple of Knossos in Crete, and the caves in the south of France.) My more recent visits to Machu Picchu, the Nazca Lines, and Sillustani in Peru also reveal a deep reverence for nature, Spirit and the cycles of life. For me, each site represents a mystical opening, a passage to something greater than ourselves, beyond the human experience. In the studio, bold symbols emerge from the inked plate in a somewhat stream-of-conscious manner, my head and heart filled with new material. The monotype allows me a spontaneous approach and results in a one-of-a kind image. Scratching the plate with a drypoint tool, I create a textural surface suggesting primeval walls worn down by time. A mystical and meditative quality references the ritual of sacred space while the curvilinear forms refer to the Divine Feminine. Symbols create openings that can connect us to the past and to the spiritual realm. As I work the surface of the plate and access these ancient forms and markings, I feel an affinity with those who have come before me. In my Mazatlan studio, the Ouroboros rears her head and almost bites her tail. The Ouroboros is an ancient symbol depicting the snake or serpent eating its own tail. There are many interpretations but in general it signifies Eternity or the never ending cycle – something constantly re-creating itself. Carl Jung named it the archetype of the human psyche. It is considered a symbol for introspection. In Alchemy, it is infinity or wholeness. The Ouroboros is closely connected to the circle and the spiral, two universal symbols that also point to wholeness and regeneration. These two symbols have been mainstays in my work over the years – but I had never used the Ouroboros until recently. What changed? After taking my group down to Oaxaca for the Oaxaca Art Vacation in July, I stayed for another week to soak in the city and the culture. I saw several works of art utilizing the Ouroboros symbol. I bought a watercolor by Hector Hernandez – a very simple cobalt blue rendition painted over some sheet music. I had recently done a series using sheet music as chine colle in my monoprints – so that caught my attention. I had admired this artist’s work over the years. On a tour of printmaking workshops in Oaxaca, the Ouroboros pops up again in this gorgeous large-scale woodcut entwined with figures. As an artist, I draw my inspiration from ancient art to contemporary works. Whose to say what and where will get the juices flowing….We all have our on voice, our own style and way of working with the imagery at hand.